Today, Avery D. Wilson appears to be a confident pillar of his community, but in this uplifting story, he reveals otherwise. Avery was bullied as a child and later questioned how being gay would affect his faith. As an adult, he feared how his parents would react to his secret. 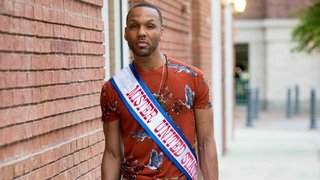 It wasn't until years later that Avery learned to accept himself – to love himself - and become Mr. United States. Paul Catalanotto started his career as a producer for a local media company in Louisiana before taking a full-time position with the Southeastern Louisiana University Educational Channel. During his two years at the channel, Catalanotto directed and produced a variety of programming including "College Night," a Telly Award-winning student entertainment show. In 2005, Catalanotto founded Untitled Films to address his interest in producing all types of visual media. He was given the Atlanta Hip Hop Award for directing the music video "Lookin' Down on Me" and placed in the top ten music videos in the 2008 Inspirational Country Music Awards with "Pictures." In 2009, Catalanotto graduated with an MFA in Film Production from the University of New Orleans. Over the last decade, several of his music videos have made it into CMT and GAC rotation, and his feature narrative "Sacrilege" (2017) has received national and international distribution. Read the full Q&APBS spoke with Writer and Director Paul Catalanotto about Avery Wilson's journey to define what it means to be the nation's gentleman. PBS: How did you first meet Avery? What was it about his story in particular that compelled you to make this film? Paul Catalanotto: Avery and I first met when I was contracted to produce sales videos and social media commercials for the Worldwide Spirit Association in Baton Rouge. He was an event emcee as well as working in their sales department, so we had a chance to work together on a variety of projects and become pretty good friends. Eventually, Avery moved on from the company to pursue other projects in dance and pageantry. Thankfully, he dragged me along, and we’ve been working together ever since. Avery was born to be in the light. He’s just an all around likable guy, and I think that’s the strength of the documentary. You want to hear what he has to say. And truthfully, I’ve always toyed with the idea of telling Avery’s story. I believe he has lived a life that could inspire someone – maybe even save someone. However, I never felt that I had an ending for the film which is why it took me a few years to propose the project to Avery. I knew the journey but not the destination. It was when he won the crown I finally knew I had a story and more importantly a reason to tell it. Louisiana Public Broadcasting (LPB) is a state network of six non-commercial, public television stations licensed to the Louisiana Educational Television Authority (LETA), established in 1971 by the Louisiana Legislature.The Mission of Louisiana Public Broadcasting is to provide programming that is intelligent, informative, educational and entertaining. LPB strives to connect the citizens of Louisiana by creating content that showcases Louisiana’s unique history, people, places and events. In addition to the programs that LPB produces, such as our weekly news magazine,Louisiana: The State We’re In, and our catalog of documentaries about the people, places and issues of importance in our state, LPB airs quality national programming. We air news programs such as "PBS News Hour", mainstay children’s shows like "Sesame Street", home improvement programs including "The This Old House Hour", as well as British comedies such as "Keeping Up Appearances", and much, much more.